Hydronic heater is specifically known for its simple operation. It is a system that simply heats water and moves it to sealed pipes through radiators throughout the home. The sealed systems can be used to heat a large varieties of spaces as and when required. The hydronic heater heats the water at it source with the help of super energy efficient gas boilers. Once the hot water has been used, it is returned to be reheated by a reticulating system. However, it needs to be noted here that this particular heating system is different from the home’s domestic hot water supply. The best thing about this form of heating system is that there are no air borne particles and thus it provides a dust free and an allergen free heating to households. Now let us try to understand as in how does hydronic heaters work. 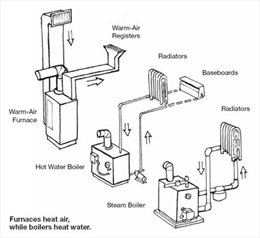 A hydronic heater uses a boiler to heat the water and baseboard convectors that is located in each room which helps in the distribution of heat. A centrally located thermostat in a hydronic heater controls the desired air temperature. When heat is required, the boiler starts heating the water that is in turn circulated through pipes to baseboard convectors. As a result the baseboard and the surrounding air is warmed as the hot air circulates through the baseboard and the heated air is distributed to the room through the process of convection. However houses which are big or has multiple rooms, the house is zoned with several thermostats that control the temperature in each of the zone. There are some hydronic systems that uses piping in the ceiling or on the floor to heat the surrounding surfaces in the various rooms and are known as radiant heating systems because they radiate heat to the room. Heated water is circulated through the pipe and it in turn warms the floor or the ceiling. At this juncture it is important to understand as to why transfer of heat through hydronic heater is so effective. This is mainly because of the way in which transfer of heat takes place. Transfer of heat in hydronic heating systems takes place in three ways. They are conduction, convection and radiation. Conduction: This is the transfer of heat from one object to the other when there is a physical touch between them. Density of the object is an important factor that affects the conducting capacity of the object. This the reason as to why liquids are better conductors of heat than gases. Convection: occurs when fluids or gases transfer circulate from one area to the other. In fact, traditional heating systems that use forced air are great examples of systems that use the convection method. Radiation: on the other hand is heat that travels in invisible waves through empty space. It is absorbed by the person or the object that comes in its way. 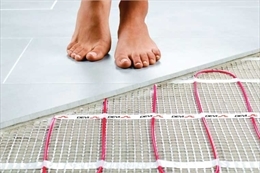 In conclusion it can be said that the end result of hydronic heating is a consistent and comfortable temperature that radiates from the floor and the solid objects which are present in the room.